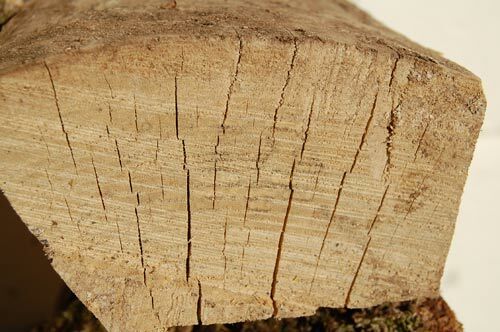 Wood should be as dry as possible for burning, otherwise a lot of the heat in the firebox is used to heat up and evaporate the water in the wood. That means you produce less heat and more condensates in the chimney. Condensates are the cause of chimney fires. Wood should be well seasoned before it is burnt. That means taking the moisture content down to 25-20% from typical values of 45-30%. Typically that means cutting and splitting the wood into manageable pieces and then air drying for the spring and summer. Ideally you would give the wood even longer to dry (ie around 2 years) but often this is not practical. The bigger the pieces the longer they will take to dry (that is one of the reasons why chopping the wood beforehand is a good idea). If trees are to be cut down for burning then this should be done in deep winter (Nov - Jan) as the tree is dormant and the sap has not yet risen. Once the sap starts rising with the onset of spring the tree’s moisture content increases and it will take longer to season the fire wood. When the wood seasons it should be protected from direct rainfall and should ideally be on a dry base. The sides of the stack are best left open so that the wind can get to the wood to dry it out. If you are seasoning the wood in a shed then slatted sides will let air through but still contain the wood. Some people stack the wood in tall rows where it has been cut and fix a small roof over the top and leave it to season like that. Other people produce a round stack to head height with an outside wall made of split logs and the inside filled with randomly placed logs. A roof can be made for the stack by placing logs bark side up on the top of the stack like roofing tiles. I've tried this method before and it certainly looks great. Another good way to tell how dry your firewood is is to use one of our Stovesonline moisture meters. 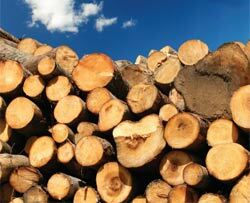 You can find firewood suppliers in your area by using our firewood supplier search.